Wire rope in continuous service should be inspected daily before operation. 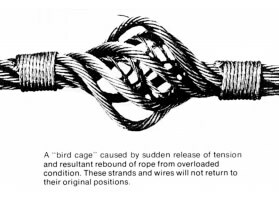 Damage from wear and tear can reduce rope strength and capacity. During inspection, look for the following warning signs – most of them indicate that the rope should be replaced. 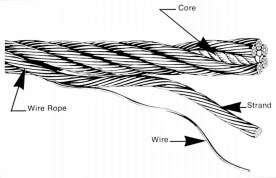 Replace rope if wear on individual wires exceeds 1/3 of their diameter. Replace 6-strand rope if stretch reduces its diameter by more than 1/3. Difficult to detect because it’s inside the rope. Look for rust, discolouration and pitting outside. Replace rope if any wires or strands are cut or burned. Damaged ends can be removed and seized, otherwise rope must be replaced. Look for strands opening up in cage-like clusters. If present, rope must be replaced. Replace rope when inner core starts poking through strands. 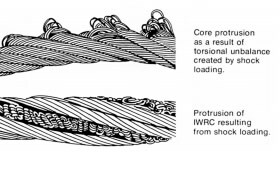 Kinks seriously reduce wire rope strength. Sections with kinks should be cut off. Otherwise, rope must be discarded.